Why IV and not Oral? Milk fever causes a cow’s digestive system to shut down, so when people give boluses or gel after a cow is showing signs of milk fever, you won’t get much, if any, benefit from them because her system will not be able to absorb the nutrients through the stomach. No digestion = No absorption! That’s why IV is essential for milk fever, it gets into the blood and works immediately. Warm your bottle in a small container full of hot tap water (regardless of what you give a cow IV, warm it up to near cow body temp, about 90-101 degrees). Be sure the bottle is closed and upright so nothing spills out or gets contaminated. Get your IV tube ready (wash, uncap Calcium bottle, attach tube to bottle) and put a sterile 14 x 2 needle (not threaded on the cap end, just smooth) in your pocket. Take the container of water and bottle/tube out to the cow. If the cow is standing, you can tie her to a post and have one person on either side of her. If the cow is lying down, put on the halter and pull her head around to her belly (it may already be, which is a sign of milk fever) and loop the lead rope around her leg above the hock and tie a safety knot (one that will pull loose easily in an emergency). Do not leave much slack – the cow should be comfortable but unable to move around too much. 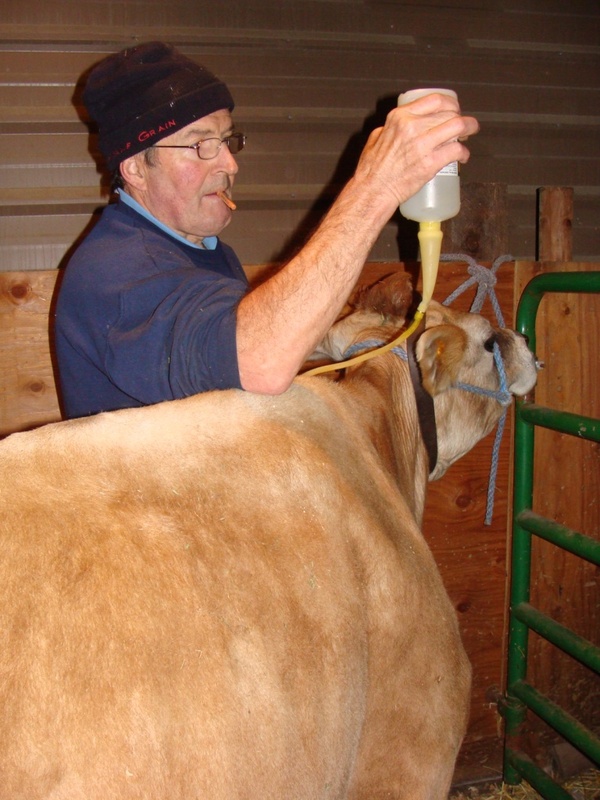 The person giving the IV should be on the most exposed side of the neck of the cow and the helper should be on the opposite side, with the supplies nearby. Find the jugular vein and rub to expose the vein. Uncap the needle and push it inward, then in the direction away from the head (needle pointed toward the heart, so in the milk vein, the needle would be pointed toward the heart & away from the udder). You kind of push straight in to get past the skin then move your hand and the needle in the direction of the head and down towards the vein, which will make the needle more parallel to the vein and push in further. Blood will come out the end of the needle in a steady flow, that’s when you know you’ve got it. Your helper at that point should have the warmed bottle of calcium ready and in their hand, making sure the liquid is down to the end of the tube. You can just pinch off the end or use the clamp that some of them come with. Just before you insert the IV tube, undo the pinch/clamp and let the liquid flow to release any air in the tube. Attach the tube to needle. You’ll then want to watch the bottle and make sure there are big bubbles coming up from the tube to indicate slow flow of liquid. If you’re not getting big bubbles or the bubbles are moving extremely slow or maybe no bubbles at all, then the needle might not be in the vein. You might also see on the skin near the needle where it is building up under the skin, which is sub-Q and not your intention. If that happens, just pop off the tube and pinch the tube or hold up the tube so you don’t keep letting out liquid. Adjust the needle or take it out and try again in another spot. Even Jay has a hard time finding a good vein on some cows! Once you get a good flow, just keep monitoring the bubbles and their speed. I would usually be the one holding the bottles, so for calcium, I’d rest my elbow on the withers of the cow and hold that arm straight up holding the bottle. You might have to lower your arm to just above the withers, but that gives you an idea of a range for how high to hold the bottle. Dextrose, you can hold the bottle practically straight up. It can go in pretty fast. With calcium, CMPK, etc., you just don’t want to “overdose” the cow with the nutrients, that’s why it needs to go in slower. 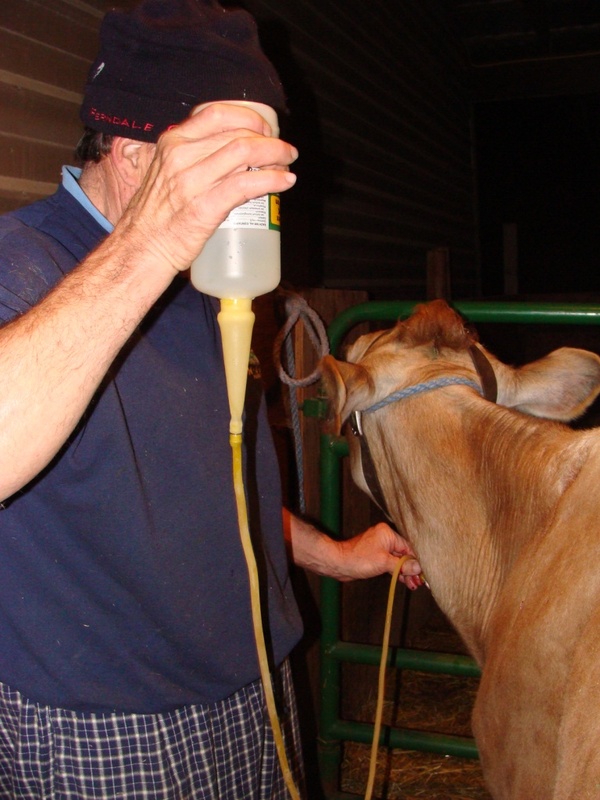 When the liquid has reached the bottom of the bottle (at the end) and is starting to go down into the tube, remove the needle from the cow and hand the needle and tube end to your helper. You can rub the point where the needle went in a little bit. Remove the halter from the cow & anything you used for restraint. If a cow reacts correctly to the fluids, her body will start quivering. You may think it’s like she’s having more contractions, but it’s really the calcium taking effect. Amazing stuff. You’ll probably see her start doing this while you’re giving the bottle. That’s a good sign! She may take a bit to get back up and stand and she may still be somewhat wobbly. Keep some tempered molasses water nearby for her to drink. Get your best or most palatable hay and have some within eating distance. You’ll hopefully see her pee or poo or both! Those are all excellent signs her body is “starting up” again. Dump the water and throw away the bottle, capped needle, and any other waste. Thoroughly clean the tube and hang to dry. Wash any blood off your hands. Monitor the cow closely for at least a half hour. She should be up within minutes. Put the water and food in front of her if she needs stimulating. Fresh, warm, soaked beet pulp with molasses is an excellent “sick cow” meal. If all goes well, you should be safe to leave the cow alone for a while, just check back on her every hour or so to monitor her progress. Does she need another bottle? Some cows need to be treated more than once. If she seems to be backsliding, consider a second bottle in the same exact manner. Your best way to avoid having to give a second bottle is to make sure she is standing, moving, eating, drinking, getting her system working again so digestion can take over for her energy/nutrient uptake. But some cows are just really out of it and may take a large number of bottles over a period of time before they are “off and running” again. For safety purposes, a new needle should be used each time, even if for the same cow. Bacteria multiply much faster than we realize! I would think you could order supplies in the US and ship them to Canada – or travel to the US to purchase? Most of the things mentioned in our article are not Rx in the US. Pingback: My Mommy Almost Died | grassfood.